IQPOS System IQPOS is specially designed for the F&B and retail industries. It utilizes the state-of-the-art technology, running on MS SQL and Microsoft Windows platform. The touch screen design of its hardware simplifies the operation method – easy touch, easy use. Managerial executives can also monitor daily business in their own offices through the internet as a connection channel to different outlets. The system integrates perfectly with Customer Relationship Management system (CRM), Kitchen Monitor System (KMS), Queuing & Multimedia Information System (QMI) and Table Management System (TMS), which further enhances one entity’s efficiency. Hardware HP t510 Flexible Thin Client Data sheet HP t510 Flexible Thin Client Clever, powerful, simple A Windows-friendly PC performance, with a punch Built with dual-core processors1, the HP t510 Thin Client helps your business create smart, simplified client virtualization desktops with powerful, PC-like deployment. With 2GB DDR31066 MHz RAM memory capacity2, this impressive multimedia solution delivers a more robust, dependable thin client experience. The HP t510 maintains Microsoft Windows Embedded Standard 7, Microsoft Windows Embedded Standard 2009, Microsoft Windows Embedded CE 6.0, HP ThinPro operating systems as well as configuration supporting the new HP Smart Zero Technology Service. Combined with today’s familiar software, the latest protocol support, firewall protection and full-featured browser—the HP t510 is ideal for maintaining your virtualized computing environments. Parking Facing the large amount of traffic at car park in commercial building and factory, UCR’s iParking solution is an easy-to-use POS system with all-in-one display machines that provides excellent performance for parking operators and drivers. Chinese Restaurants In recent years, Chinese restaurants industry has become more competitive due to the increased demand of customers. One business could be easily replaced by another if it is not managed well. IQPOS offers a comprehensive POS system that provides the most effective and reliable solution for such business management. Restaurants & Cafés A presentable restaurant or a café does not merely provide quality of food, but also excellent services with prominent corporate image in order to retain customers. A dynamic POS system that utilizes the state-of-the-art technology is therefore essential to the industry. UCR Technology’s unique Intelligent Quick Point-Of-Sales System (IQPOS) – Fine Dining Mode provides a complete and reliable solution to streamline such business operations. HK Style Cafés The Hong Kong Style Cafes are said to be the most representative of Hong Kong restaurants and are famous for its quick service and a variety choice of meals. Yet, these café owners often need to encounter plentiful problems that arise to them everyday. IQPOS definitely meets the needs of such users by delivering its distinctive solution. Japanese Restaurants & Kaiten Sushi Bars In recent years, Japanese kaiten sushi bars have become one of the most popular cuisines in Hong Kong. However, there are often operational complexities that may have negative impact on sales volume. IQPOS is able to resolve these hassles straight away. Fast Food Chains It is common to see a packed fast food chain with long queues at the cashier. It is crucial for such business to obtain a systematic POS system in order to manage well. The fabulous functions of Intelligent Quick Point-Of-Sales (IQPOS) ~ Retail Mode are definitely applicable in the busy fast food industry. Its simple touch screen method s combined with its outstanding functions that enables prompt, accurate and efficient transactions in daily operations. What's more? Its remote central management provides an expedient platform for executives to get access to data and monitor daily business activities of each single branch. Bakeries A sustainable POS system is well indeed needed by any sizes of a bakery or a cake shop in order to assist with daily business operation as well as inventory control. The Intelligent Quick Point-Of-Sales System (IQPOS), newly developed by UCR Technology, is certainly applicable in such kind of industry. A lot of successful users greatly appreciated our products and services since becoming our clients, including Hong Kong Yamazaki Bakery Co., Ltd., King Bakery Holdings Ltd. and Bread Talk Group Ltd. etc. Small Workstation HP t510 Flexible Thin Client Data sheet HP t510 Flexible Thin Client Clever, powerful, simple A Windows-friendly PC performance, with a punch Built with dual-core processors1, the HP t510 Thin Client helps your business create smart, simplified client virtualization desktops with powerful, PC-like deployment. With 2GB DDR31066 MHz RAM memory capacity2, this impressive multimedia solution delivers a more robust, dependable thin client experience. The HP t510 maintains Microsoft Windows Embedded Standard 7, Microsoft Windows Embedded Standard 2009, Microsoft Windows Embedded CE 6.0, HP ThinPro operating systems as well as configuration supporting the new HP Smart Zero Technology Service. Combined with today’s familiar software, the latest protocol support, firewall protection and full-featured browser—the HP t510 is ideal for maintaining your virtualized computing environments. Successful Business Expansion of Victoria Harbour About Victoria Harbour Restaurant Group Victoria Harbour Restaurant Group contains few famous brands of Chinese restaurant. The first shop opened in 1999, and now a total of 18 shops are in operation in Hong Kong and Shenzhen with significant potential for further growth. Mazazu Crepe Founded in 1998 and with more than 40 stores in Japan. MAZAZU CREPE is famous for its delicious and healthy crepes. Also, it has expanded oversea markets, including Singapore, Korea, Canada, Australia and Thailand through the sale of franchise. Pokka Cafe Pokka Corporation (HK) Limited (“Pokka”) was founded in 1989. 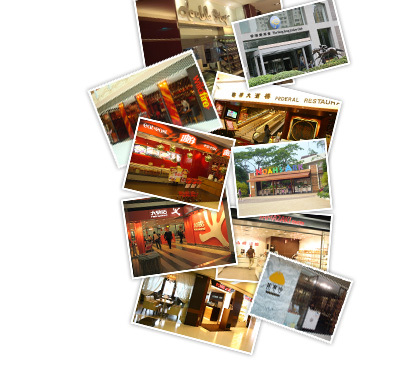 It is dedicated to operate high quality dining services and is in leading position among Hong Kong. Pokka has been co-operating with UCR for more than 20 years. bma Investment Group Limited bma invested in various projects in the greater china area for a diversified business portfolio, including entertainment, advertisement, sports and publication and so on. Since 2009, bma ventured into the F&B industry and set up different kinds of restaurants and entertainment spots, such as Shanghai Lo, Red MR KTV and Loyal Dining. Based on the Hong Kong spirit of "dreaming big and aiming high", investing several millions in the 60's/70's themed restaurant "Dai Pai Dong", which becomes the hip place in town as well as one of the landmarks of Hong Kong. one2free - CSL Limited one2free was launched in 1996 by CSL to introduce, aimed at the young and dynamic market segment. In keeping with its progressive nature, one2free re-brands it self to enable it to take its exciting products and services to the whole family through new customized solutions aimed at every family member in April 2008. Noah’s Ark Is Noah’s Ark Back? Once upon a time, God commanded Noah to build a gigantic boat called an "ark" that saved Noah, his family and a group of the world’s animals from a global flood – Noah’s Ark. Today, the world’s only Noah’s Ark replica with the size mentioned in the bible was being built! It is now located at Ma Wan Park and opened to public recently. Treasure Lake Catering Holdings Limited Treasure Lake Catering Holdings Limited was founded in 1999 and has been expanding its business in operating over ten branches in the city, including Treasure Lake Seafood Restaurant, Treasure Lake Golden Banquet, North Garden Restaurant, Hoi Po Seafood Restaurant and so on. Federal Restaurants Group Since 1972 and up until now, Federal Restaurant Group (“Federal”) has built a well-known reputation in Hong Kong, providing Cantonese cuisine, Shanghai cuisine and Thai food for customers who have particular dining preference. Yamazaki Baking Co., Ltd. For over 60 years, Yamazaki Bakery Co. Ltd. (Japan) has been continuously producing the best quality breads and has become Japan’s No. 1 bakery brand. They first stepped upon Hong Kong in 1981. Today, they have 37 outlets and an enormous factory, with more than 500 staffs in Hong Kong. UCR Technology has more than 80 technicians all over Mainland China, Macau and Hong Kong. Let’s take a look into one of our technician, Mr. Cheng’s job and finds out how UCR provides efficient and professional technical support services to our customers. On the 28th of September, we had a friendly match with Fairwood Group again. However, it took place at the basketball court this time. Our friendly soccer match with Fairwood Group was being held in Kwun Tong on July 15, 2009. It began with a score of 2:2 in the first half and finished with a final pleasant score of 8:8 at the end. UCR was delighted to promote our POS solutions with our business partner, Hewlett-Packard HK SAR Ltd., at the Retail Asia Expo & Congress 2009 which took place at the Hong Kong Convention and Exhibition Centre on June 24th-26th, 2009. Time flies, Union Cash Register Co., Ltd. has been serving the market for 44 years. Since our establishment, every single member of UCR has been persistently gaining the very best effort to the company and clients, in order to meet our dedicated commitment. I-Watch Surveillance System is not only a typical CCTV, but also works in conjunction with data capture. With the advanced tools, it helps in monitoring cashier area remotely, associating POS transaction data with videos and recording videos for retroactive analysis. I-Watch captures each transaction process and clearly displays transaction details on screen, users are able to search suspicious transactions promptly by keywords such as item name, check void and payment amendment etc. By utilizing the innovative monitoring system, loss can be greatly prevented. The I-Watch Surveillance System is suitable for hotels, clubhouses, chain stores, cafes, bars and different types of restaurants etc. Banyan Seafood Restaurant (Holdings) Ltd.
Hong Kong Yamazaki Baking Co., Ltd.
Kiangsu & Checking Residents (H.K.) Assn. COPYRIGHT © UNION CASH REGISTER CO. LTD. ALL RIGHTS RESERVED.